Tag Archive | "Candy Cane Tetra (Hyphessobrycon bentosi)"
The Candy Cane Tetra (Hyphessobrycon bentosi) is also known as the HY511, Ornate Tetra, White Tip Tetra, False Rosy Tetra, Bentos Tetra, and White Fin Ornate Tetra. Hyphessobrycon bentosi is native to the Amazon basin in Peru and are found in the densely vegetated, shaded, slow moving creeks that branch off from the Amazon River. Candy Cane Tetras are a schooling species that are similar in appearance to their close relative the Rosy Tetra (Hyphessobrycon rosaceus) which is why tropical fish keeping enthusiasts have aptly named them False Rosy Tetras. Candy Cane and Rosy Tetras both have pink to salmon colored bodies with darker red markings on their fins however, the bodies of Candy Cane Tetras are a bit more transparent. 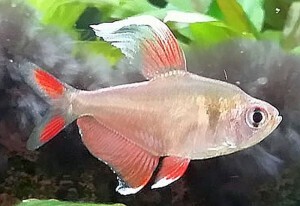 The Candy Cane Tetra will also have a faint grayish “shoulder patch” marking that is absent on the Rosy Tetra. The Candy Cane Tetra will always have white tipped dorsal and pelvic fins (hence the name “white tip”), while the Rosy Tetra may not. 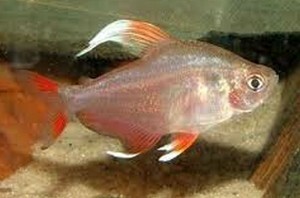 The Rosy Tetra always has a black “flag” marking on it’s dorsal fin that is absent in Candy Cane Tetras. Males of both species will have longer fins and the females are usually shorter and more plump. Candy Cane Tetras are a shoaling species that should be kept in groups of at least 6 or more specimens. They can be safely housed with smaller rasboras, barbs, tetras, Anabantoids, angel fish, Discus, Apistogramma dwarf cichlids, Corydoras, small Loricariids and other Hyphessobrycon or Hemigrammus species. They do best in a dimly lit, 20 gallon or larger aquarium with a river sand or fine gravel substrate that is densely planted and aquascaped with a few pieces of driftwood and river rock. Leave them plenty of swimming areas and because they come from densely vegetated, dimly lit, dense forest black water pools, they do not like fast moving currents; so angle any returns or power heads away from main swimming areas in the tank. Like many South American tetras, Candy Cane Tetras require clean stable black water conditions to thrive. Adding a few handfuls of catappa leaves to the tank or some aquarium safe peat to the filtration system will provide these conditions. A few floating plants will also give them a sense of well being. Regular bi-weekly 30% to 50% water changes are a must for these fish. Breeding the Candy Cane Tetra is tricky. The breeding pair should be isolated in a separate tank with floating or other fine leaved plants where the female will distribute her eggs, and a seeded sponge filter to provide aeration and water circulation. Immediately after spawning, the parents should be removed from the tank. The eggs hatch in 24 hours and about five days after hatching, the fry should be free swimming and can be fed infusoria or finely crushed flake food. The fry are slow growing and should be isolated until they are too large to be eaten and the breeding tank water should be changed out on a regular basis until then. Candy Cane Tetras are easy to feed and will readily eat micro pellets , quality flake foods, and “treats” of fresh, frozen, or freeze dried bloodworms , tubifex, and brine shrimp. Feed them several small portions daily. Hyphessobrycon bentosi are frequently available in tropical fish keeping shops at reasonable prices when they are 1 1/2″ to 2″ in size.